There are hundreds of options when looking for the best materials for you horse fence rail. 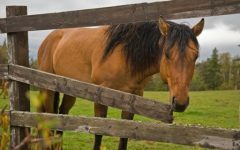 Any drive through the countryside will reveal all sorts of materials used for horse fencing in different ways, so what will be the best option for your horses. Have some give in it to cushion impacts. High enough for visibility and discourage jumping. No bulky attachments, fittings, sharp knots or other projections. Look good and be affordable. Quality, good looking horse fencing can add value to a property and indicates professional and pride in ownership to visitors. 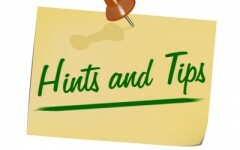 This can be very important when buyers are coming to look at your horses, or if you are running an agistment farm. 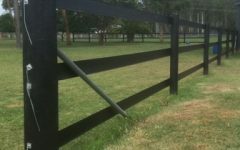 We will broadly describe in this blog and identify the major advantages and disadvantages of the major types of horse fencing. We will not discuss brands and specifics just the broad categories. 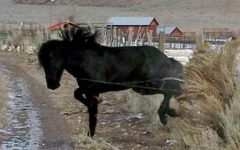 wners who have successfully kept horses without injuries behind barbed wire several key points eliminate its use. Poor visibility. Horses have a hard time seeing the fencing even when there are multiple strands. As such the “barb is a deterrent” idea is flawed. If you have barbed wire fencing and cannot replace it immediately please make an effort to increase the visibility of the fence, perhaps use a sight wire or rail. Alternatively strips of material tied to the fence can hav e a limited benefit in increasing the visibility. Horse can get a leg caught between wires and because of the barb this can be catastrophic. The chances of this are increased greatly when the wire becomes slack over time if maintenance is not done regularly. 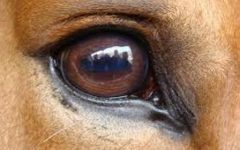 There are some horrific images on social media and the web (which I can’t bring myself to post here) of horses when have got their bridles caught in barbed wire fencing. 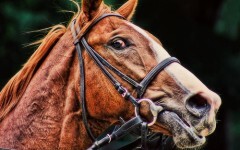 Once caught up, or if any part of their anatomy is between the wires, a simple fright can see the horse suffer horrific injuries on the sharp barbs. 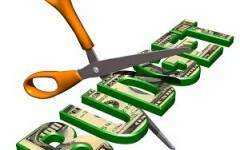 amage is catastrophic, ugly and very expensive. Sometimes barbed wire is used on the top of fencing to discourage the horse feeding on the grass in the neighbouring paddock. Such use can cause nasty cuts and abrasions to the horse which is merely leaning over the fence. Don’t take my word for it, talk to a vet, or simpler still look at this vet’s blog. It is also a useful source of information on safe fencing types. Standard fencing wire as it is known in Australia is a viable and economical material for fencing a large number of livestock types. However it is simply not suitable as a replacement for horse fence rail. Similar to barbed wire, fencing wire lacks the visibility required for our horses. Commonly horses get their legs caught between the wires, and often because the wire is strained, the horse is severely cut when it removes the hoof. 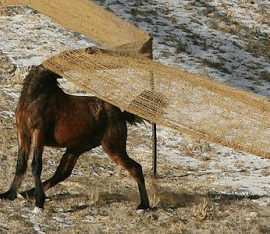 When wires become slack entrapment can occur and horses often get their legs wrapped in the wire. 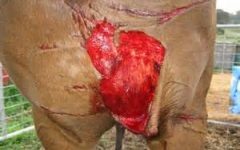 This causes them to panic and again nasty cuts and serious injury can occur. Braided ropes, nylon braid, and coated wire. These fence types should be seen as an improvement to standard wire fences as they tend to be less sharp and abrasive. But alas still don’t provide a complete solution due the visibility issue and entrapment similar to fencing wire. They are also too resistant and too thin leading to nasty injuries. These types of fencing are therefore are often used in conjunction with a timber top rail or in addition to safe and sturdier fence materials. 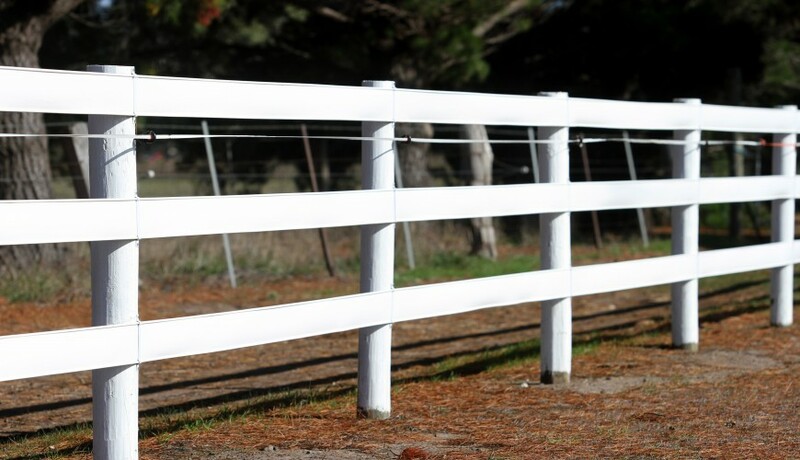 These materials are often used together with a sturdier horse fence rail to electrify the fence line. 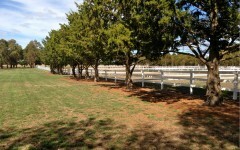 If you have a rope/braid fence please consider an upgrade with a broad panel horse fence rail. Either a flexible top sight rail or perhaps a timber top rail. This might provide sturdiness and visibility of the fence line. Regardless we do not endorse these materials for safe horse fencing without the use of mesh, timber or flexible rails as the backbone of the fence. They lack sturdiness and therefore can fail to contain horses. Also when not electrified their flimsiness can lead to entrapment issues. They can flap about in strong wind and be quite loud. The narrower tapes can suffer from the visibility issues mentioned above in wire fencing. Please be aware of suppliers who claim the bright colours of some tapes overcome this, when in fact horses do not benefit in sight as much as we do on bright colours, rather broadness and height of the tape will be more critical. Better still choose a more sturdy and visibility fence material. Woven tapes fences can get dirty very quickly and grow mould. This can be quite unsightly in particular on the light colours. There woven nature makes them very difficult to clean. As an additional electrified line to other fence materials tapes can be useful, otherwise stay clear of this option. 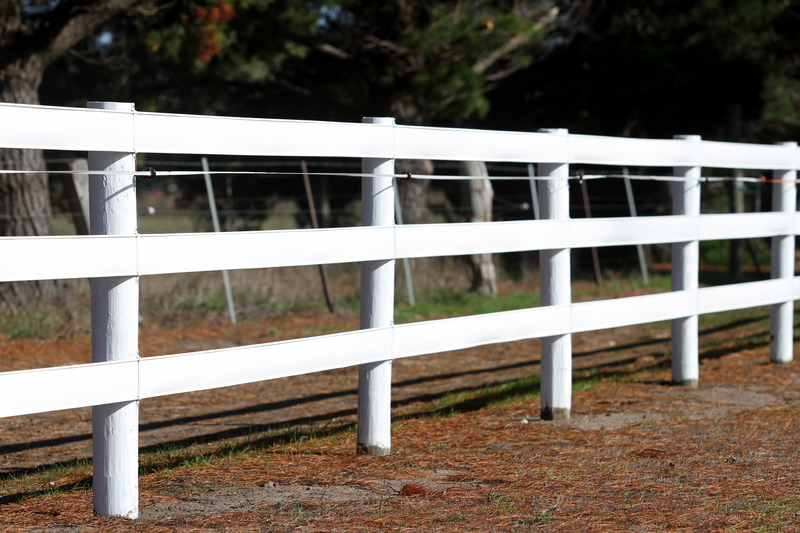 There are some attractive looking rigid PVC fences available in the Australian horse market. However PVC fences are not proving to be effective for horse fencing. Often they lack the sturdiness required to contain such large animals. PVC is inherently difficult to stabilise for UV, suffers from heat exposure and eventually becomes brittle. When PVC breaks it can splinter and also leave very sharp edges and points which are an impalement risk. The Australian market was first introduced to PVC fencing in the 1960’s. There have been numerous attempts and frankly failures to replace all types of fencing since then with PVC alternatives. PVC Star pickets failed due to UV degradation, they broke leaving horrendous sharp edges and were difficult to remove from the ground. PVC fence palings also failed due to UV degradation and could not be replaced, requiring removal of entire fences. 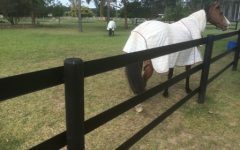 There were even some attempts at flexible PVC fencing for horses (in particular for NSW) and again its vulnerability to UV and heat meant they failed on site. Polyethelene based flexible rails are the accepted industry norm due to the polymers long life and UV stability. 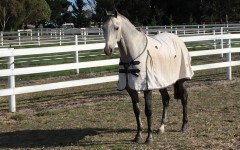 Mesh fencing can be very safe for your horses due to its visibility and sturdiness. It can be low maintenance and durable. 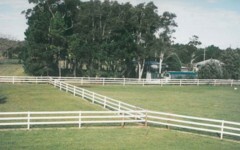 Mesh fences are often recommended for keeping foals. Often there is a little bit of a trade of with appearance though, as these fences can make your property look like a cage. Make sure the mesh you are using is specified for horses. Other options can be cheaper but often lack sturdiness and can have sharp edges, sharp wire nots. 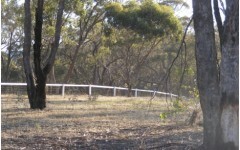 It is recommended to have a timber board, or rail of flexible fence, on the top to prevent horses leaning over the mesh and to increase visibility. The mesh can become dangerous if it become slack or sags due to stretching or sagging. Make sure the mesh is fitted accorded to instructions and be aware of the cheap options as they can lack the “structural rigidity” to remain taught and safe in the long term. As always safe fences are well maintained fences. Timber fencing can be very sturdy and durable. 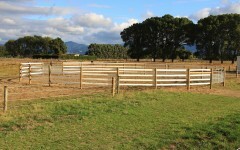 Therefore timber fencing can be very safe horse fencing. The quality will come down to three factors, first the grades of timber used, second the installer, design of the fence. 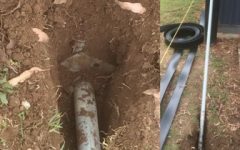 Installation errors are the most common source of problems with timber fences, as they are put together without instruction, on a case by case basis. Design issues need to be thought out as well. Because you are not buying a kit with instructions make sure the fence abides by the rules for height, spaces between rails, and requirements for smooth edges etc… as for any other type of fence. Be aware that timber tends to splinter so there is some injury risk to the horses. If your horses crib or like to chew on wood this can be a problem. Anti-cribbing paints have some success but need reapplication and some horses are just so determined to chew that there is no stopping them. 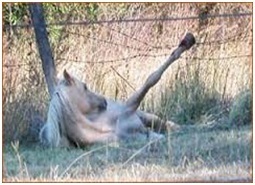 Horses also like to test solid timber fences by rubbing against them. Over time this can lead to injuries due to splinters, and the displacement of rails and exposure of sharp nails. Timber fences need to be regularly inspected an maintained. Ultimately the safety of a fence is to be judged by what happens when a horse impacts the fence. 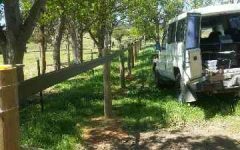 When horses collide with a timber fence, in particular at speed, the fence is not forgiving enough, lacks flexibility and sever injury can occur. Unfortunately impact with a timber fence can be quite harsh. Timber fencing can be high maintenance, in particular painting and repainting. Also rails often need refixing after impact. Moisture can be a problem so can termites. In the Australian market there are problems getting the hardwood grades of timber previously used for fencing. This has lead to a decreased life expectancy for timber fences which needs to be taken to account in your budget. All that said, a well designed timber fence can be highly attractive and if well maintained painted etc… provide a reasonable life expectancy. 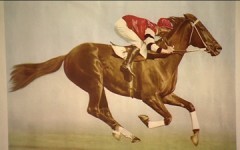 Some horse owners simply insist on the “traditional timber look”. When well designed, installed and planned they are sturdy which makes them more sutiable than some of the other fencing types mentioned above. These flexible rails attempt to capture the traditional timber look while further enhancing horse safety with their flexibility. Often reinforced with two wires (preferably high tensile) and sometimes three wires (when cheaper materials are used) these rails provide significant durability and long life. These systems can provide for a cushioning effect upon impact with a horse. However they are sturdy enough to provide a significant deterrent for a repeated attempt. They can be easily restrained and maintenance is usually minimal. They never need painting. These rails should be over 100mm wide, are usual around 120mm or 5inches wide, to provide for visibility and the aesthetics of a timber fence. Narrower rails can look significantly cheaper. These systems come with the necessary attachments and it is important to ensure these are as small as possible, low profile and contain no rough edges. Some systems have unsightly, large devices, often mid rail which detract from both safety and the appearance. We must declare our interest here in fairness. We have manufactured Bounce Back Horse Fence for over 30 years and it is exactly this type of fencing material. We have found the system to provide for a long lasting fence with numerous first year fences still in place today. Apart from a little cleaning here and there they are looking as good as new. The key component for low maintenance on these systems is the quality of straining posts and appropriate bracing techniques must be used. If this is done properly, and a high quality polymer rail (like ours) is purchased the rail will require little in the way of maintenance. Fence Planning for horses, E Wheeler & J Smith, Penn State University(www.cas.psu.edu).